Nearly a week after this column reported that the Raleigh-based Civitas Institute has been promoting a bigoted and frequently anti-Semitic website, the conservative group has issued only a brief and incomplete comment on the matter and is still linking visitors to the controversial site from its Carolina Plott Hound web platform. The Triad Conservative is a website based in Guilford County that frequently publishes bigoted and anti-Semitic commentaries. Last Sunday, it featured a post under the headline “Josh Stein’s Ethno-Lawsuit” in which it alleged that North Carolina Attorney General Josh Stein, who is Jewish, had joined with other state attorneys general in contesting Trump administration immigration policy initiatives as part of a Jewish conspiracy to dilute the nation’s Christian majority. On Monday, September 11, the post, including a picture of Stein, was prominently featured throughout the first half of the day in an all-caps headline on the Civitas-owned Carolina Plott Hound – a conservative news aggregation site. The headline linked directly to the Triad Conservative story. 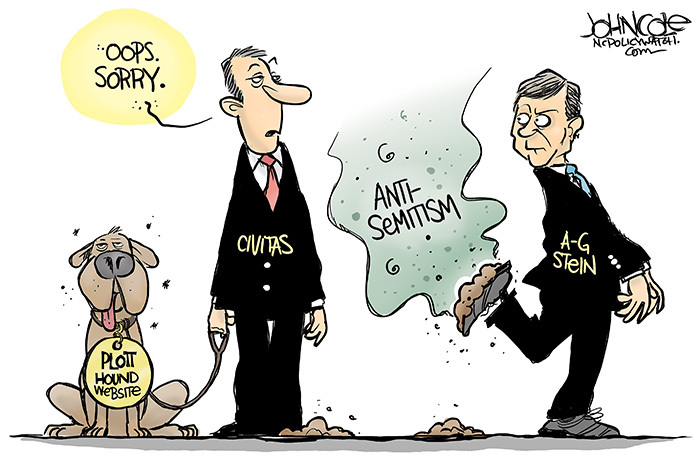 As of this morning, however, the Plott Hound still provides a direct link to the anti-Semitic Triad Conservative in the list of conservative destinations it features prominently on its website. While one supposes that De Luca’s grudging and partial admission of wrongdoing in this matter is better than nothing, it’s not much better. After all, the Plott Hound has been spreading hateful garbage as a Civitas owned and controlled dog whistler for years, but throughout that period, neither Civitas nor the Plott Hound has made this fact public. Even today, there is no public acknowledgment by either entity of the name of the Civitas employee who edits the Plott Hound. And, the Triad Conservative isn’t the only loony tunes website to which the Plott Hound redirects visitors. The site also links, for instance, to the ravings of a disturbed individual named Orson Scott Card, who repeatedly compared President Obama to Hitler and claimed that he planned to install himself as national dictator. The whole matter is rendered even more outrageous, of course, by the fact that Civitas is not some independent rogue actor. Rather, it is a closely integrated component in North Carolina’s most powerful conservative policy machine. Originally known as the J.W. Pope Civitas Institute, the organization receives the overwhelming majority of its funding – more than $1 million last year – from the John William Pope Foundation – a group headed by the state’s most visible conservative financier, Art Pope, and staffed by Pope’s close confidant and former John Locke Foundation President, John Hood. De Luca’s admission that the Plott Hound and Civitas are one and the same makes clear that Pope and Hood — two powerful and influential men who go to great lengths to portray themselves as high-minded and principled conservatives with libertarian leanings – are either directly complicit in the Civitas-Plott Hound endeavor or shockingly negligent in reviewing the work of one of their largest grantees. Not surprisingly, Hood, who has often emailed me on various matters down through the years, has chosen not to reply to the inquiry I emailed him last Monday regarding this matter. Comment: Though laudable in intent, this statement is almost certainly incorrect. By providing funding to Civitas, BCBSNC did support, at least in some small part, all of the organization’s endeavors, including the Plott Hound. Comment: Again, whatever Duke’s intent for its contribution, by supporting Civitas it clearly supports all of Civitas’ work. Comment: Hmmm. All of Time Warner Cable’s past sins were washed clean by the merger that took place in May of 2016? As for bullet #2, see the comments above. The real test for all of these funders and others, of course, will come going forward. Let’s hope that this latest incident explodes, once and for all, the mythological image Civitas has attempted to create for itself as a responsible participant in the state policy debate that is somehow deserving of respect and financial support from prominent individuals, foundations and corporate funders. Let’s fervently hope that he wasn’t serious about this statement and that it was more akin to the kind of embarrassed, spoke-too-soon response sometimes uttered by a person caught in an improper public act who tries jokingly (and ineffectively) to spin his or her way out of it. We condemn the outrageous and unacceptable anti-Semitic attack on Attorney General Stein in the strongest possible terms. We are mortified that a website we have supported helped to promote this scurrilous attack as well as other racist and bigoted statements. The person responsible (name here) no longer works for the Civitas Institute and the Carolina Plott Hound website has been suspended until such time that all links to other racist, anti-Semitic and otherwise bigoted sites have been deleted. We apologize to the people of North Carolina. 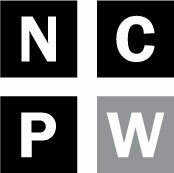 Until a statement of this kind is forthcoming, we here at NC Policy Watch will be proud to remain thoroughly offended.